Depending on thermal conditions the 280X can be as little as 17% faster than the D700 or as much as 30% faster, assuming it's not memory bandwidth limited. In the case of a memory bandwidth limited scenario the gap can shrink to 9%. 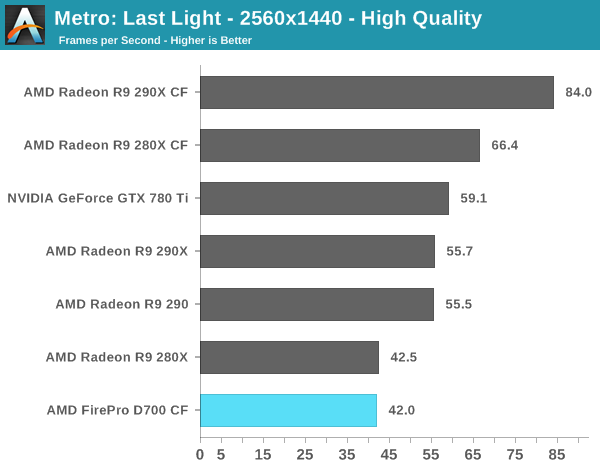 All of the results below are using the latest Radeon WHQL drivers at the time of publication (13-12_win7_win8_64_dd_ccc_whql.exe) running 64-bit Windows 8.1. Keep in mind that the comparison cards are all run on our 2014 GPU testbed, which is a 6-core Ivy Bridge E (i7-4960X) running at 4.2GHz. In other words, the other cards will have a definite CPU performance advantage (20 - 30% depending on the number of active cores). You'll notice that I didn't run anything at 4K for these tests. 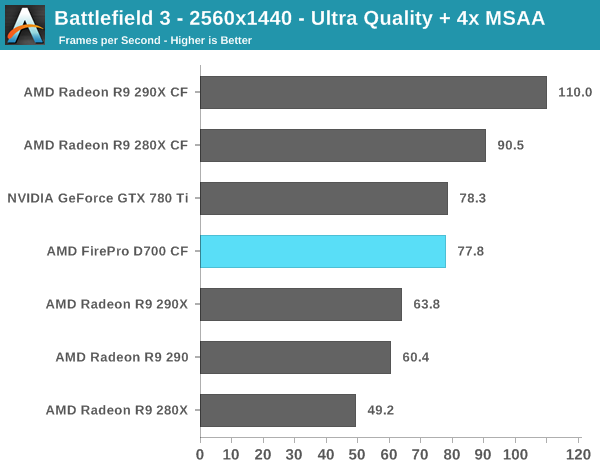 Remember CrossFire at 4K is still broken on everything but the latest GCN 1.1 hardware from AMD. Battlefield 3 starts out telling the story I expected to see. A pair of 280Xes ends up being 16% faster than the dual FirePro D700 setup in the Mac Pro. You really start to get an idea of where the Mac Pro's high-end GPU configuration really lands. 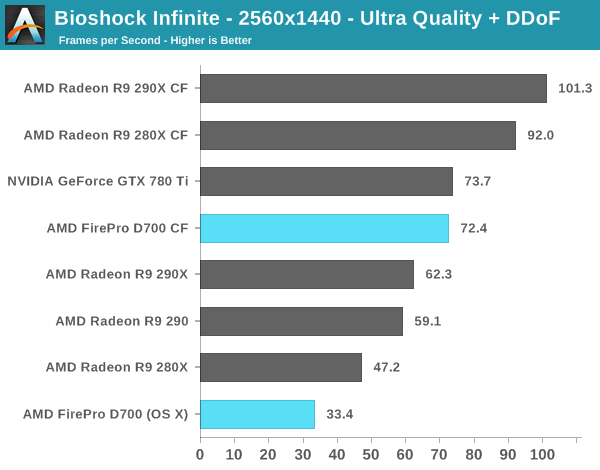 Bioshock ends up at the extreme end of what we'd expect to see between the 280X and D700. I tossed in a score from Bioshock under OS X, which obviously doesn't have CF working and ends up at less than half of the performance of the D700. If you're going to do any heavy 3D gaming, you'll want to do it under Windows still. 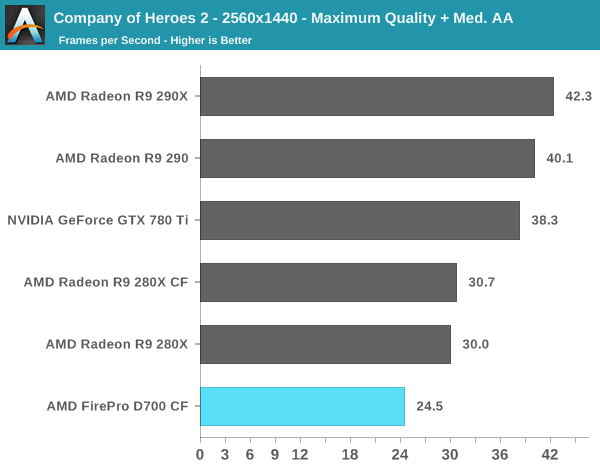 Not all games will scale well across multiple GPUs: Company of Heroes 2 is one of them. 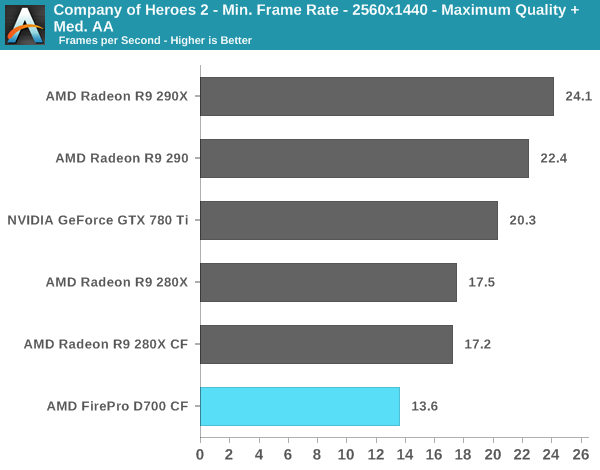 There's no performance uplift from having two 280Xes and thus the D700 performs like a slower single GPU R9 280X. Metro is the one outlier in our test suite. Although CrossFire is clearly working under Windows, under Metro the D700 behaves as if it wasn't. I'm not sure what's going on here, but this does serve as a reminder that relying on multi-GPU setups to increase performance does come with a handful of these weird cases - particularly if you're using non-standard GPU configurations. Could I know which of the 2 graphics boards is artifacting (showing red spots or vertical lines?) while using 2 monitors.
" I don't see much room for Apple to move to more powerful GPUs though. "